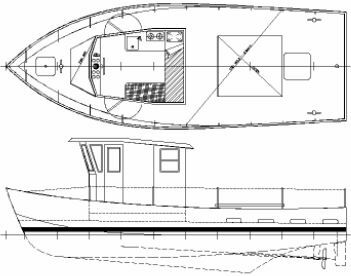 This little hard chine steel vessel was commissioned to be an inexpensive and robust workboat for fishing in open water. She is also suited to harbour service work, short-haul cargo, inter-island ferry and similar duties. The pilothouse layouts all have inside control positions as well as upper and lower berths. The two larger layouts also have galleys and seats and the largest also has enclosed heads. Below decks she has an insulated hold of 4cu.m capacity accessed through the deck hatch. 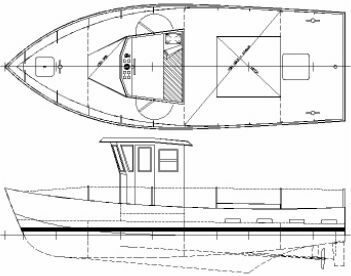 The engine space is located below the pilothouse and accessed through removable panels in the pilothouse sole. Forward is a baitbox or general storage box for warps etc. Construction of the hull and deck is of steel, using longitudinal stringers over transverse frames. 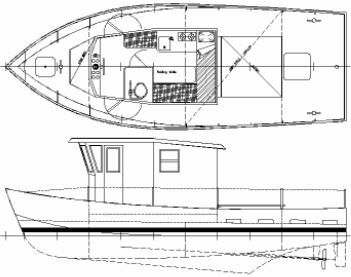 The pilothouse and the hatchcovers to the hold are of aluminium or plywood to reduce the displacement and lower the CG. Powering can be to the owners' requirements to suit the intended use of the particular boat. The minimum recommended is 25hp and the maximum 80hp. Tankage can be adjusted to suit the owner's needs.